Whisk 2 tsp egg white with a fork. Add 200g unblanched almonds, mix well. Crush 5g sea salt with ½ tsp paprika and toss with the nuts. Tip onto a lightly oiled baking sheet and shake out in a single layer. Cook at 220°C, gas mark 7, for 5-6 minutes until beginning to colour. Leave to cool, then tip into small dishes. 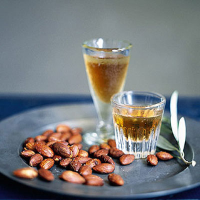 Serve with chilled dry sherry.